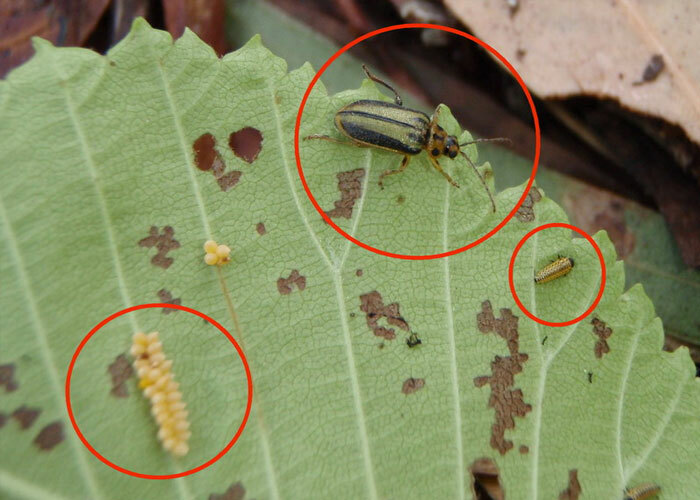 The Elm Leaf Beetle (Pyrrhalta luteola) is a common and ongoing threat to elm trees in Victoria. Each year, when the warmer weather arrives, the beetle attack begins and trees show signs of stress. Both larvae and beetle feed on elm leaves and can defoliate your trees in a single season. Without treatment, Elm Leaf Beetle numbers will continue to increase, causing your trees to decline and die. Our simple, annual treatment involves injecting a targeted insecticide into each tree’s trunk. The sap carries the treatment up to the leaves, where it kills the insects without harming the tree.